Cut the loaf of fresh French bread into thick slices. Mix the chopped pecans and cinnamon together and spread out on a plate or shallow dish. Whisk eggs, sugar, milk (you can use almond or coconut milk), vanilla and salt in a medium sized bowl. Preheat the oven to 225°F and heat a large skillet on the stovetop. Spray the pan with cooking spray. I used a coconut oil spray that I really love. Dip the bread into the egg mixture, then lightly press slices into pecans. Place the bread on the skillet and brown each side. Place on the baking sheet and bake the French toast for another 10 minutes. Garnish with blueberries for color and taste, and serve immediately with maple syrup. 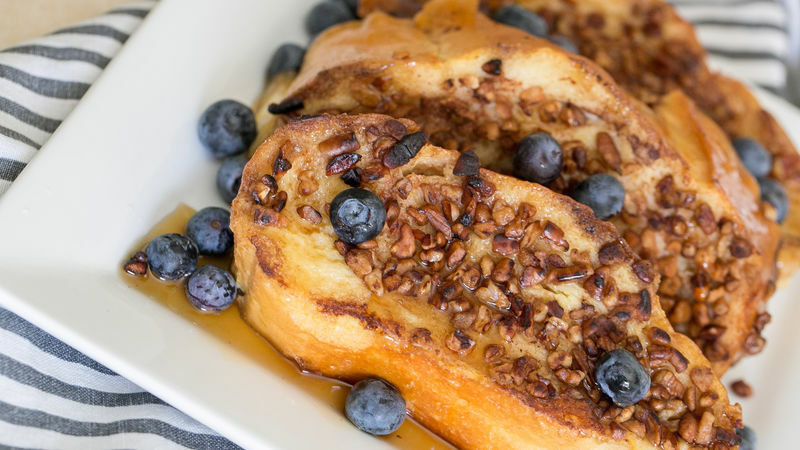 Pecan Crusted French Toast with Blueberries is an easy win for holiday entertaining. Today is National French Toast Day! So this Thanksgiving, let's not forget to give thanks to the one breakfast-brunch recipe that feeds our souls in the morning. I swear, a good piece of French toast can help cure a sleepless night. But instead of the basic French toast recipe, this time we've added some toasty pecans and extra cinnamon in the mix. I think it gilds the lily and definitely exceeds expectations. Start off with a nice loaf of French bread and a few easy ingredients. Whisk eggs, sugar, milk (you can use almond or coconut milk), vanilla and salt in a medium sized bowl. Preheat the oven to 225ºF and heat a large skillet on the stovetop. Spray the pan with cooking spray (I used a coconut oil spray that I really love). Dip the bread into the egg mixture. Then lightly press into the pecans. Place the bread on the skillet and brown each side. Place on the baking sheet and bake the French toast for another 10 minutes. Then enjoy the flavor and crunch with your guests!